"Just as traditional cars are taken into gas stations refueling, electric vehicle drivers can take their cars to public electric vehicle charging stations to recharge their car batteries." - AeroVironment, Inc.
1. Does Ford make any electric cars? Yes, Ford has been manufacturing the gas-free Focus Electric since 2011, making a 2012 debut in select cities around the United States, and available to the general public in 2013. 2. How can Ford Focus Electric drivers charge their cars? 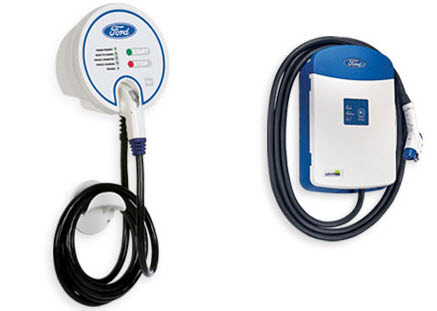 Ford Focus Electric owners can purchase a home charging station through EV Solutions. This way, they can charge their electric cars at home, at their own convenience. 3. How long does it take for the Ford Focus Electric battery to fully charge? The time it takes to fully charge the battery depends on several factors, but can take a minimum of four hours. 4. How fast can the Ford Focus Electric go? The Ford Focus Electric's top driving speed is 84 miles per hour. 5. What's the range of the Ford Focus Electric? The Ford Focus Electric has a range of 76 miles (or 122 kilometers). 6. What is the curb weight of the Ford Focus Electric? The car's curb weight is 3,691 pounds (or 1,674 kilograms). 7. How much horsepower does the Ford Focus Electric have? This electric vehicle has 143 horsepower (or 107 kilowatts). 8. What kind of public recognition has the Ford Focus Electric received since entering the market? In 2011, the Ford Focus Electric received the Green Car Vision Award, and was ranked by the U.S. EPA as the "most fuel-efficient car sold in the United States in the compact class" in 2012. 9. How many doors and seats does the Ford Electric have? The Ford Focus Electric has five doors and five seats. 10. Is the Ford Focus considered a sedan? Like other hatchbacks, the Ford Focus Electric is considered a compact vehicle.